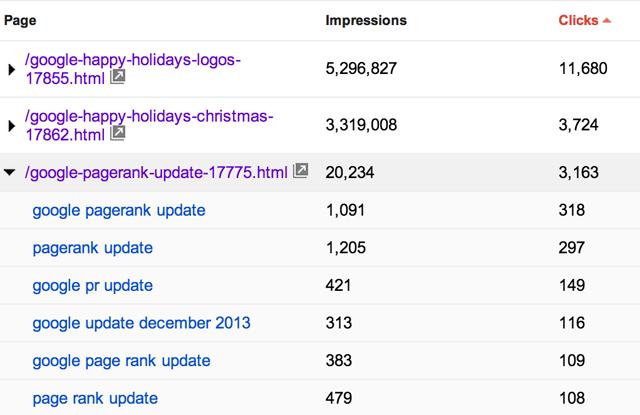 You know the search queries report in Google Webmaster Tools? Of course you do. Do you know, you can show your top pages by impressions and clicks? Did you know that now you can see the top keywords that led to impressions and clicks to those pages? Cyrus Shepard posted about it on Google+ and it is true. Here is a screen shot showing that you can expand the page report to show the keywords that led to the traffic to that page. As Cyrus said, "Massive, much needed improvement.﻿"
Indeed, this gives you back some of the data Google took away with [not provided] and SSL search.